Oh how I love summer fruit. Ruby red strawberries, crimson through to black cherries, tart yet sweet raspberries and the array of different currents. I am definitely a soft fruit fan and love to eat them freshly picked, or use them in delightful, dessert recipes. This Strawberry Eton Mess is a classic English dessert, that is best made with fresh, local strawberries. Strawberry Eton Mess a delicious trio of ingredients. 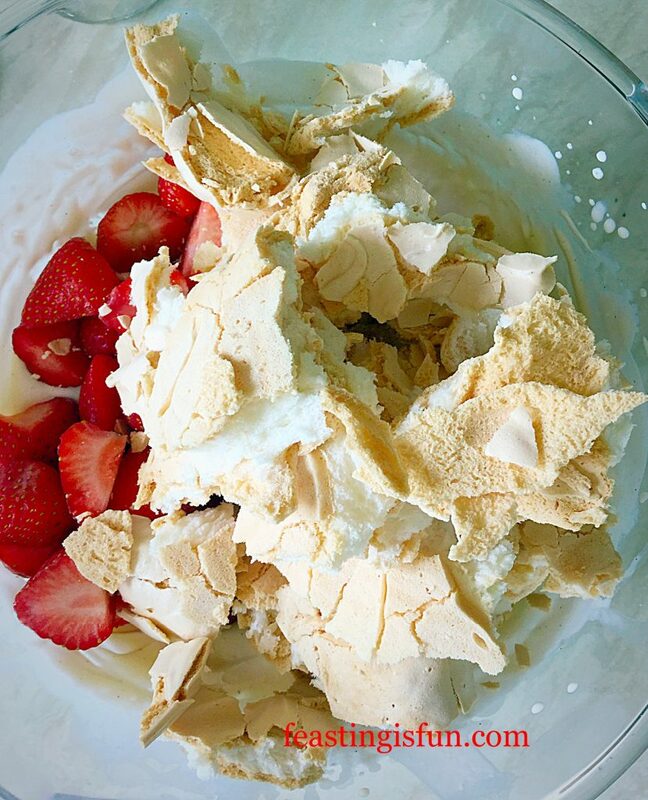 While homemade pavlova provides a crisp and marshmallow like texture that I’ve enveloped in lightly whipped cream, with sweet luscious strawberries. 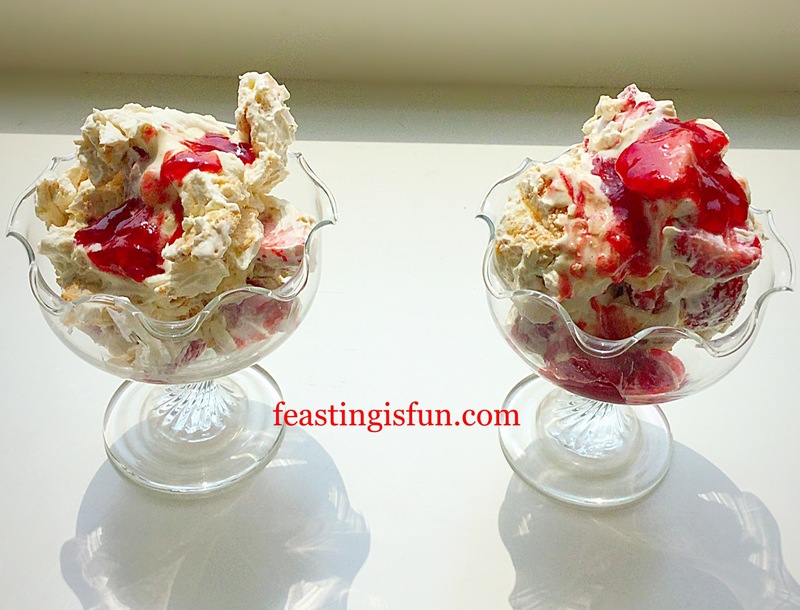 Strawberry Eton Mess the perfect make ahead dessert. 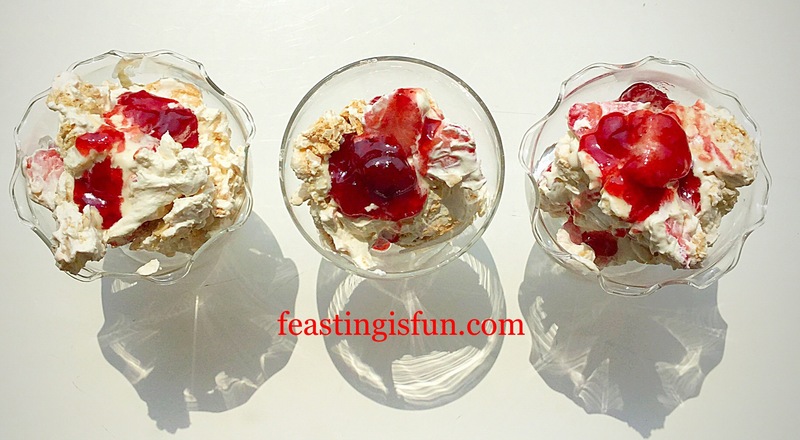 Since this Strawberry Eton Mess is so easy to assemble, it is also brilliant as a make ahead dessert. The pavlova can be made the same day, or even the day before, strawberries can be hulled, quartered and left covered in a bowl and the cream takes only a couple of minutes to whisk by hand. Finally, all of the ingredients can be assembled prior to serving, for a stress free delectable dessert! 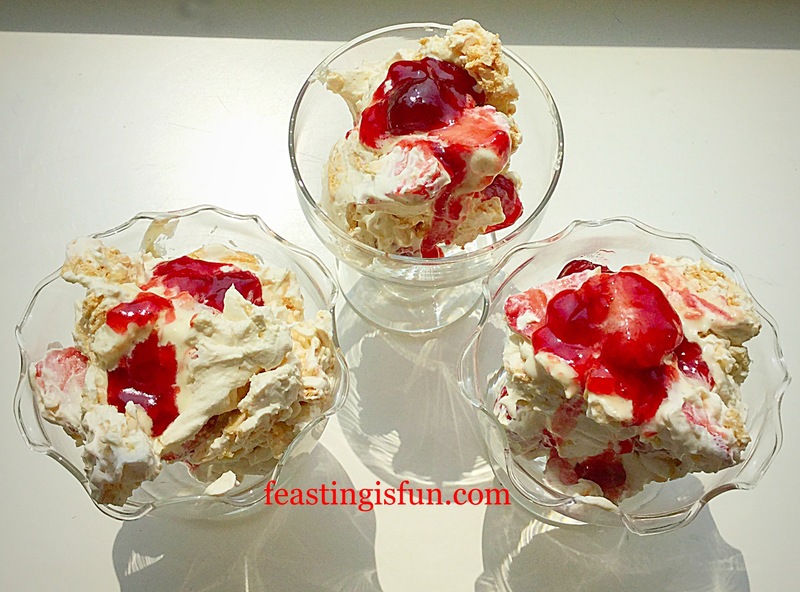 Strawberry Eton Mess a classic English summer dessert. True to my word, I am adding more desserts to Feasting is Fun. My family are loving the new-ish aspect to my blog!! 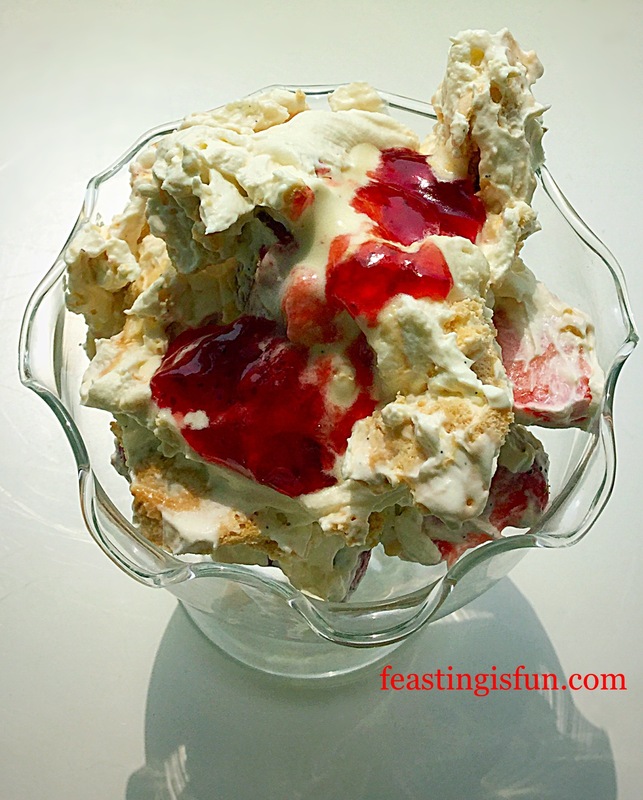 This Strawberry Eton Mess is probably one of my favourite desserts. The differing textures within the pavlova and the fresh local strawberries really make this a stunning dish. 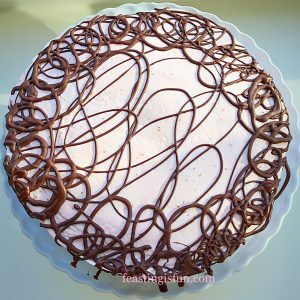 As with all recipes, especially those that have few ingredients, it really is worth buying the best that you can afford. 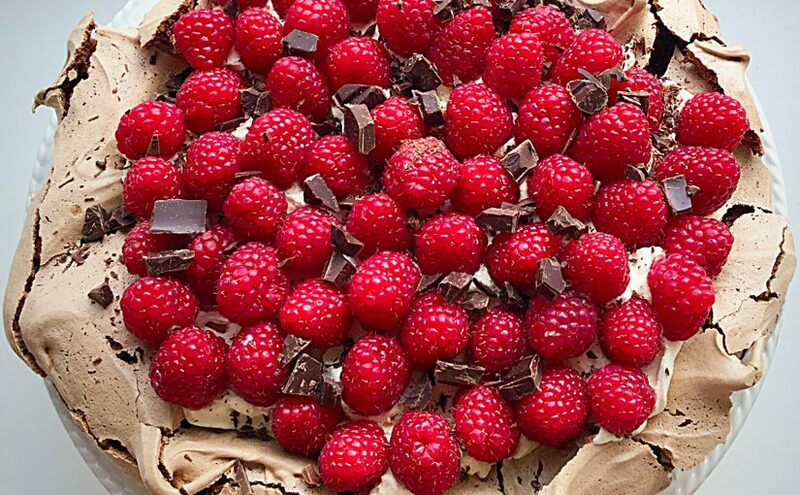 Or in the case of this dessert, taking the time to make your own pavlova. 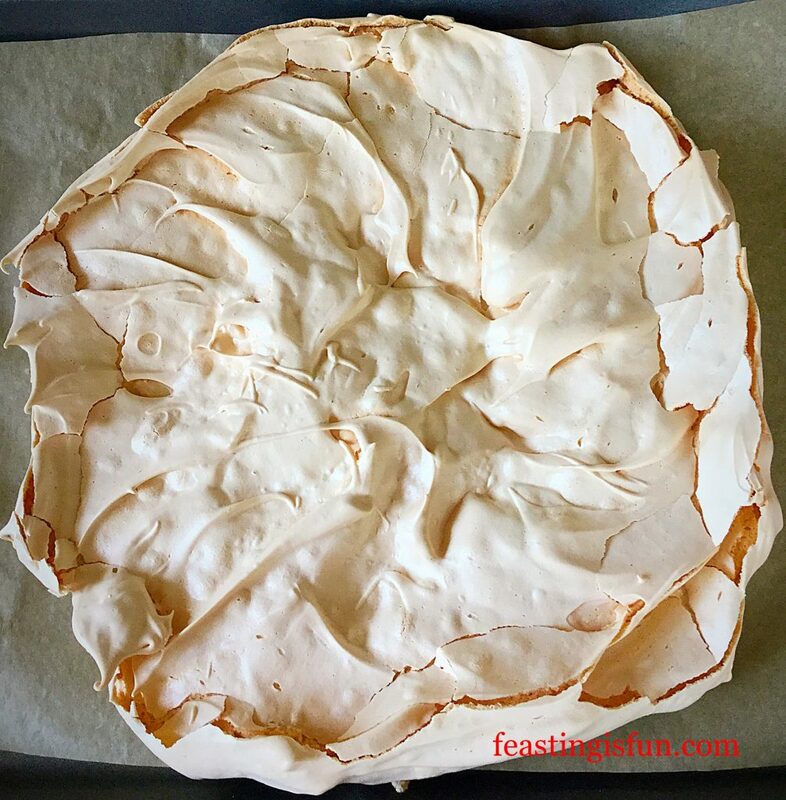 I know ready made meringues are easily available in supermarkets, they won’t give the marshmallow inner softness that a homemade pavlova yields. 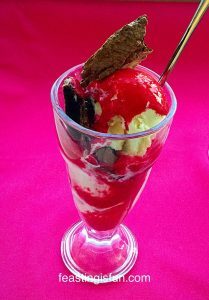 If you make your own ice cream like my Strawberry Ripple Ice Cream then you will be left with 4 eggs whites. The exact amount needed for this recipe. Strawberry Eton Mess topped with a drizzle of strawberry jam. 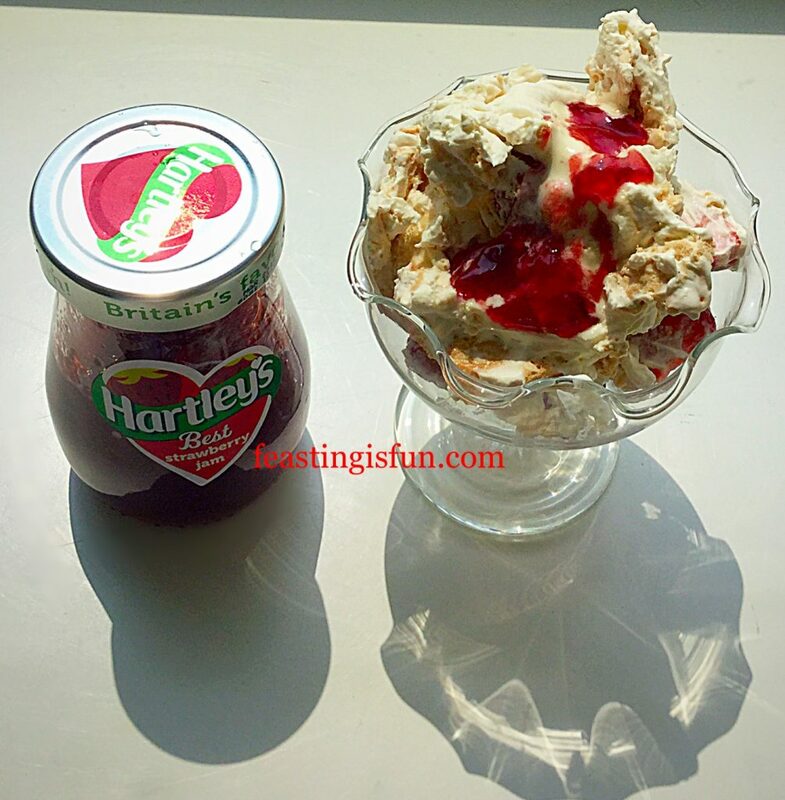 I was fortunate to win some Hartleys strawberry jam on Twitter. Warmed slightly, so that it becomes a sauce, it adds the perfect finishing touch to this dessert. 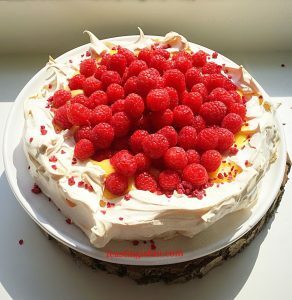 The bright red colour contrasts beautifully with the pale cream meringue and it lends an extra strawberry hit as you take your first mouthful. First of all line a large baking tray with baking parchment that has a 20cm circle, drawn in pencil, on the underside. 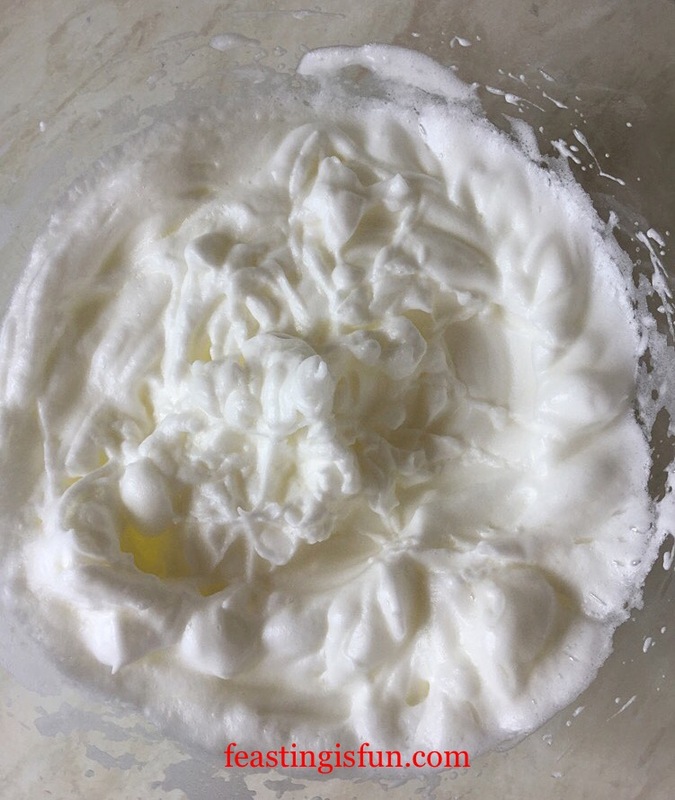 Into a spotlessly clean, large bowl place the egg whites. Whisk until the egg white hold a stiff peak. The meringue peaks stand proud. 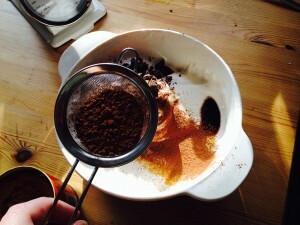 While whisking on a medium speed gradually add the sugar. 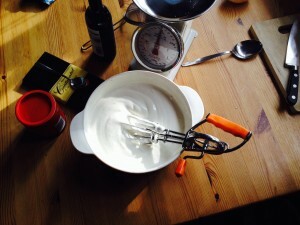 Continue whisking until the meringue is glossy and shiny. Sift in the cornflour and add the vanilla and vinegar. Shiny, glossy meringue, ready to have the extra ingredients folded in. 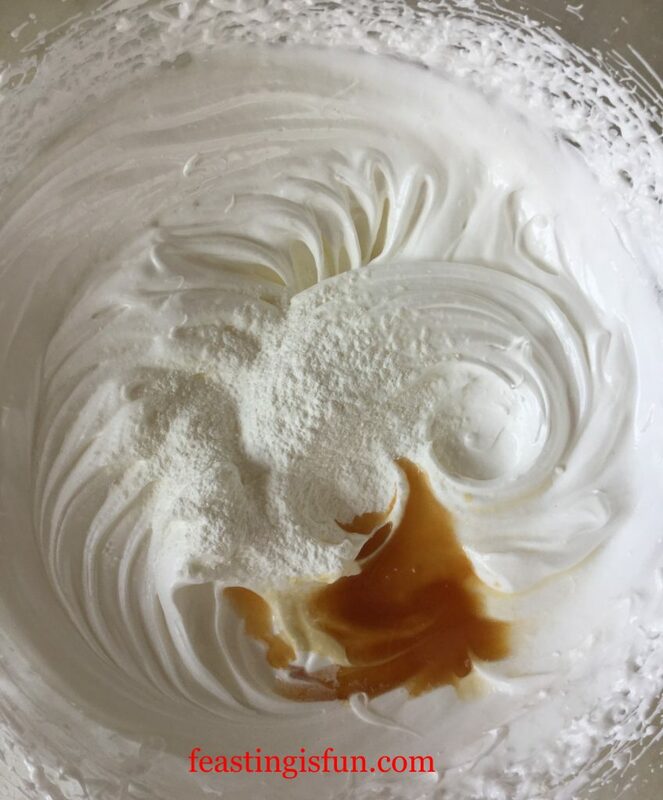 Using a large metal spoon gently fold in the added ingredients into the meringue, turning the bowl until they are fully incorporated. 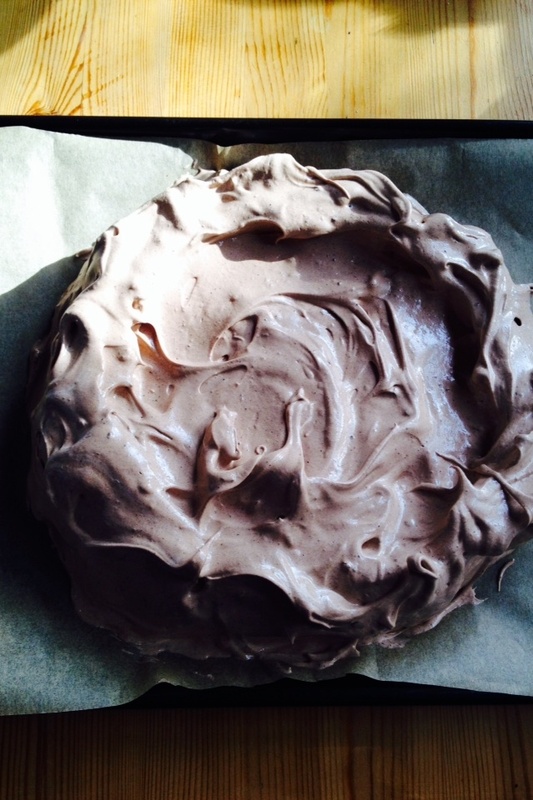 Spoon the meringue on to the baking parchment, keeping within the circle marked on the reverse. 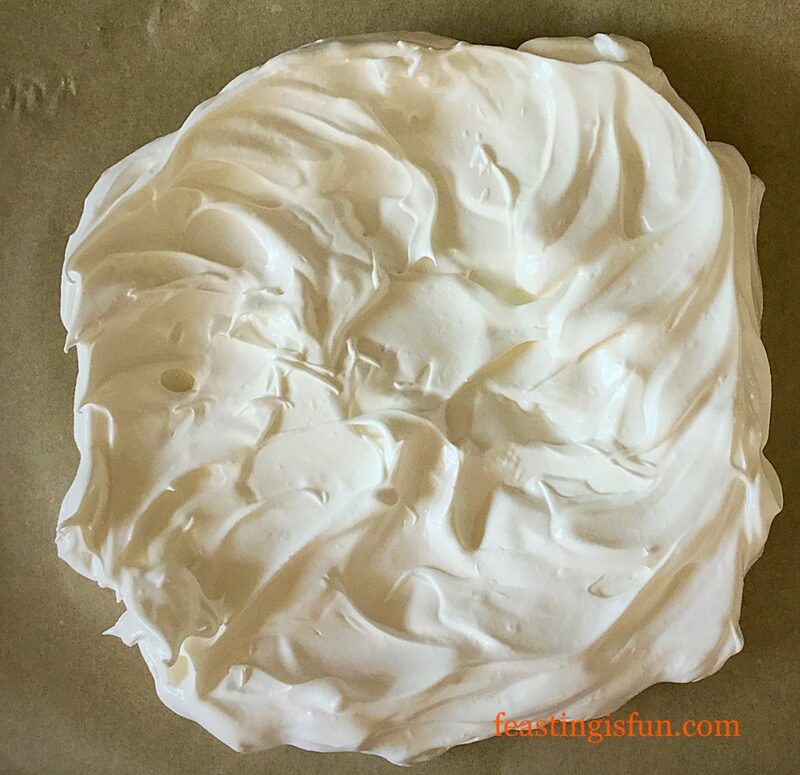 Spread the meringue out so that it forms a circle and slightly build up the sides so that they are a little higher than the centre. This pavlova is ready for the oven. Place the pavlova into the centre of the oven and immediately turn the temperature down to 140C/120C fan, gas mark 1. Bake for 1 and 1/4 hours. 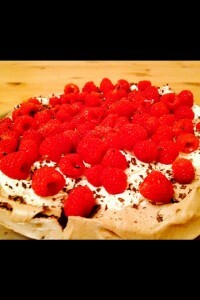 Then turn off the oven and leave the pavlova to cool inside the oven with the door very slightly ajar. Once cooled removed the pavlova from the oven. 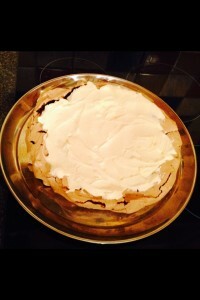 Cover the pavlova and baking tray in cling film until ready to use. Hull and cut the strawberries into halves or quarters, depending on their size. Into a large bowl add the cream, vanilla bean paste and caster sugar. Whip the cream until it thickens, but is still floppy – not stiff. 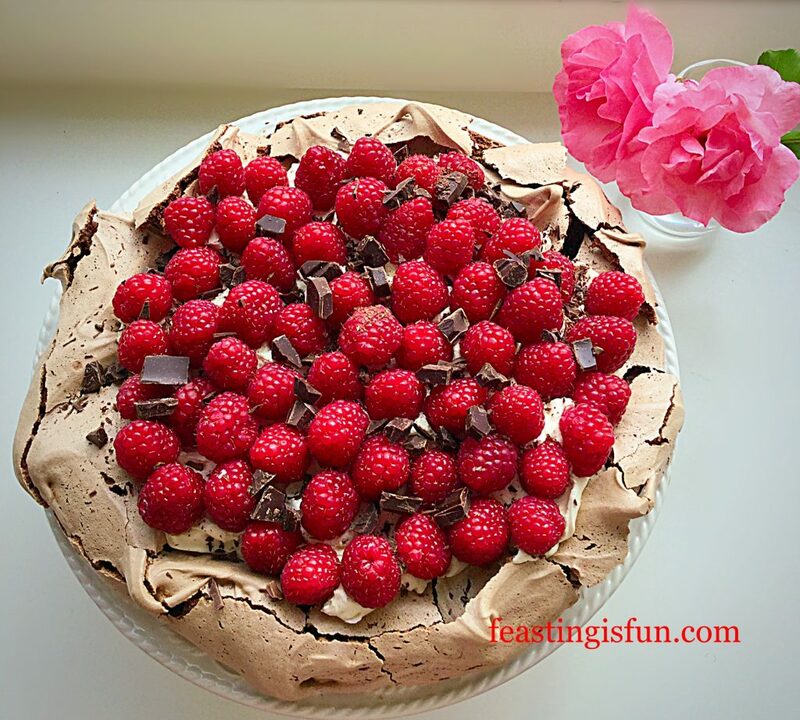 Add the strawberries, break the pavlova up into bite size chunks and add those too. Strawberry Eton Mess you can see the marshmallow insides of the pavlova. Fold all the ingredients together with a large metal spoon. Serve in pretty glass bowls with a drizzle of slightly warmed strawberry jam. Strawberry Eton Mess serve with a spoon and a smile. 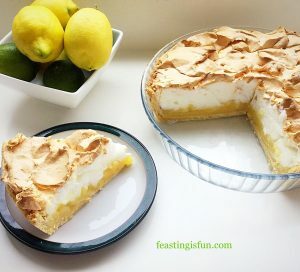 Because this is such an easy to assemble dessert, with a little preparation beforehand, you too can sit down and enjoy eating this with family, friends, or whoever you have invited round. Also, if you wanted to up this Strawberry Eton Mess to the next level, a drizzle of my Boozy Berry Sauce, served cold, on top would be a fantastic idea! That’s one for the adults though. 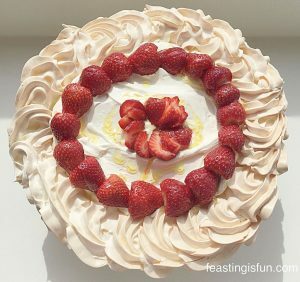 Strawberries and cream are such a classic combination and here, in this dessert, they are lifted by the presence of amazing, homemade pavlova. 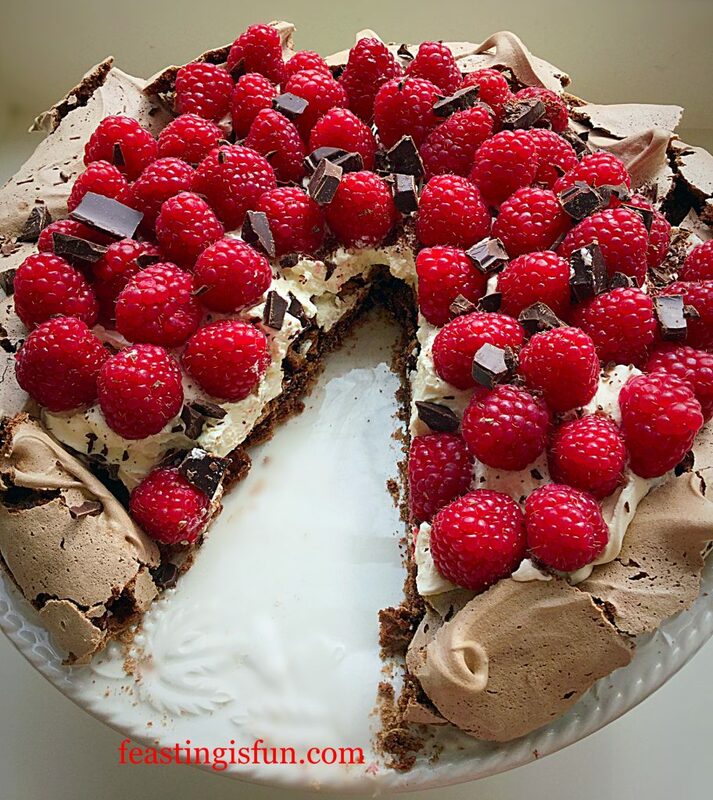 Tip: The pavlova itself can be covered in whipped cream and tart berries (passionfruit is also exceptionally good). One recipe two desserts! Delicious Lemon Pavlova slathered in cream, decorated with strawberries and finished with a limoncello drizzle. 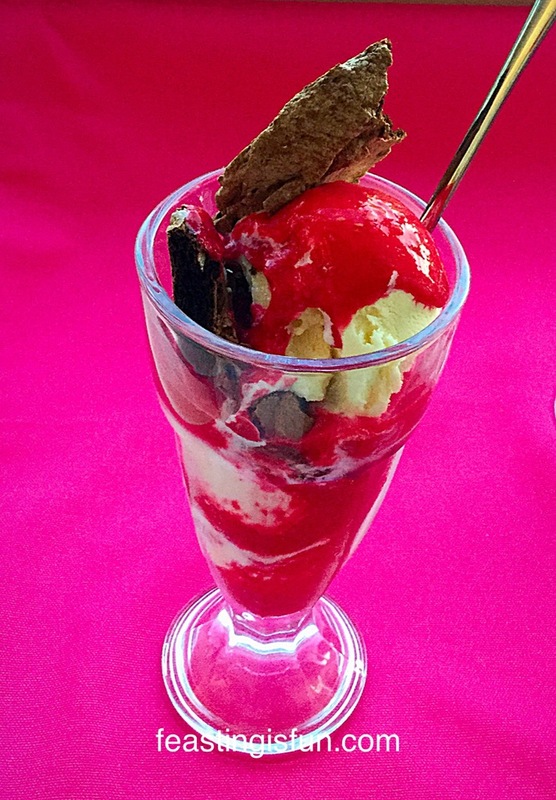 Vanilla ice cream layered with chocolate meringue and unbelievably good raspberry sauce. 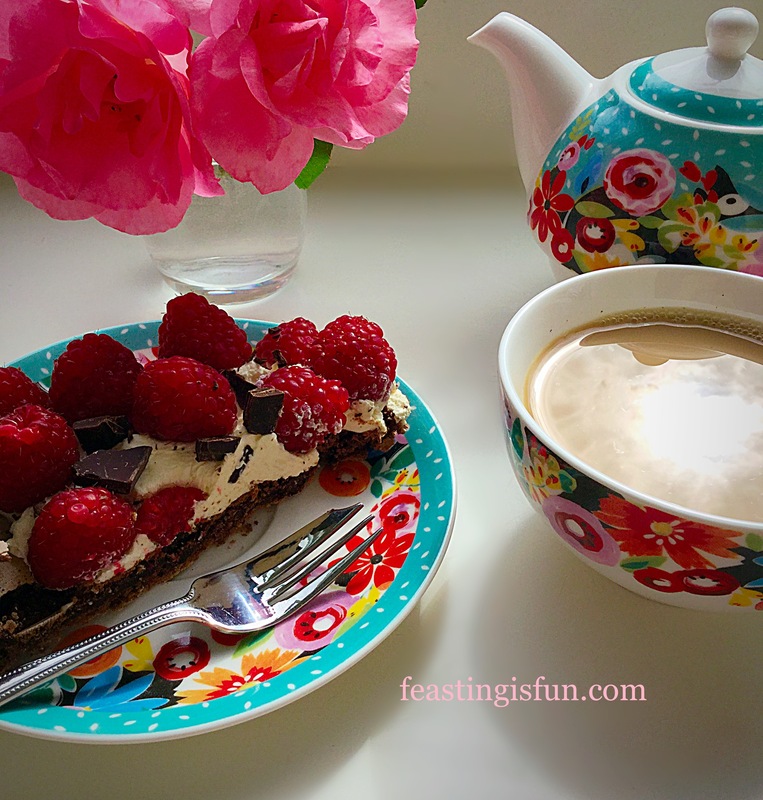 Light Raspberry Cheesecake on a Chocolate Brownie base – so good. I hope you’ve enjoyed this post and have been encouraged to make and bake a pavlova. 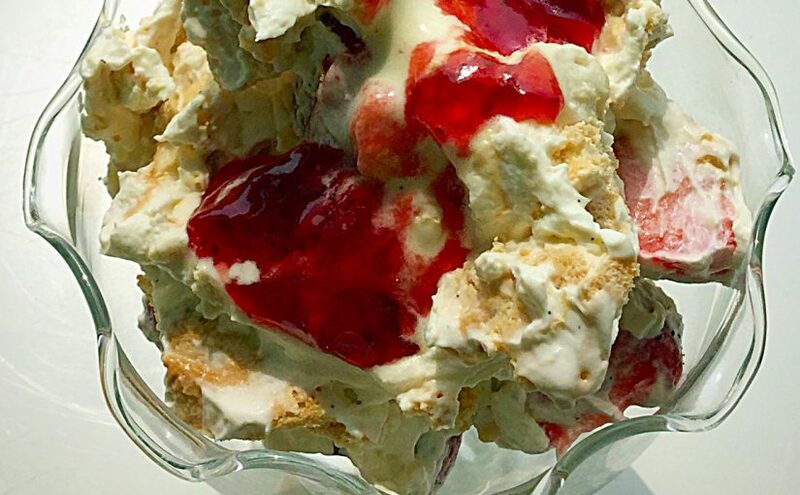 It doesn’t matter if they sink, or crack as it can all be covered with cream and fruit, or crumbled into the best Strawberry Eton Mess you have ever eaten! Have fun making and baking in your kitchens. 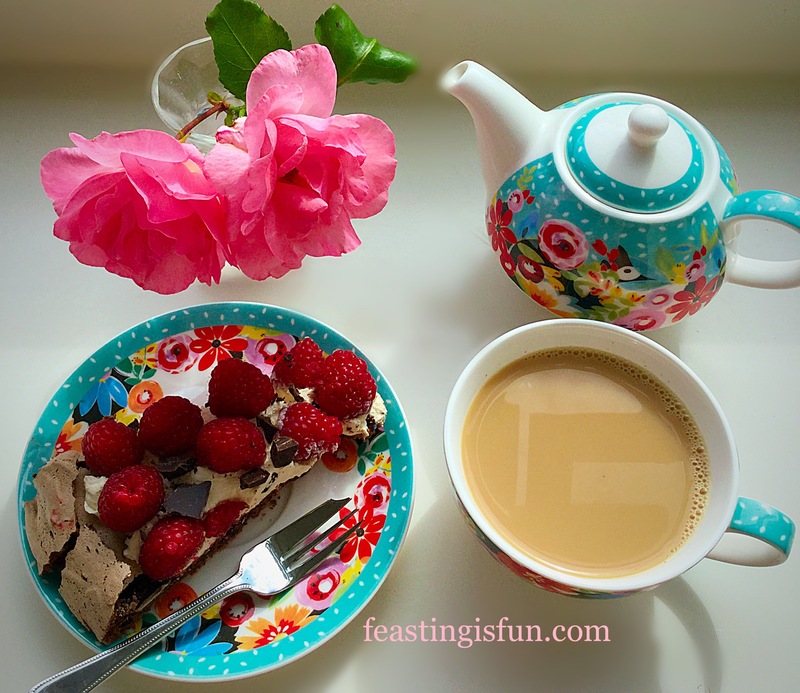 Keep the photos and comments coming, I’d especially like to see ones of you sharing your delicious feasts? This is not a sponsored post, the jam was won in a competition on Twitter.